This may not surprise you, but Motorola plans to bring its new flagship smartphone that’s now exclusively available in the US through Verizon carrier, to other regions. Dubbed DROID Turbo, Motorola’s smartphone is likely to arrive at other carriers in the United States, but also in other countries where the handset maker still operates. Although previous rumors claimed the DROID Turbo would be launched at AT&T as soon as Verizon’s exclusivity period expired, it looks like the smartphone will be first released elsewhere. GSMArena reports that Motorola DROID Turbo has been confirmed to arrive in Brazil on November 5. However, the handset will be released as Motorola Moto Maxx, as the DROID name is exclusive to Verizon. 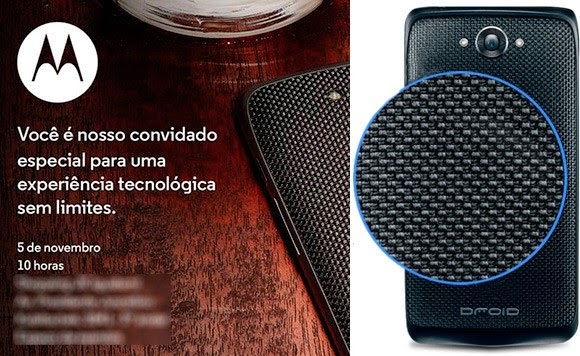 The information has been confirmed via an invitation that Motorola Brazil recently sent to the press. The only thing that remains to be confirmed would be the actual name of the smartphone, as Moto Maxx is just a rumored name. But given the fact that the DROID Turbo is powered by a huge 3,900 mAh battery, the Moto Maxx name would make perfect sense especially that the previous RAZR and DROID Maxx models are equipped with high-capacity batteries as well. The information may also have been confirmed by the fact that Motorola recently trademarked the “Moto Maxx” name in the United States. Motorola DROID Turbo aka Nexus 6 mini is a smaller alternative to Google’s Nexus 6, which comes with a huge 6-inch Quad HD display. Unlike Google’s new flagship smartphone, the DROID Turbo packs a much smaller 5.2-inch Quad HD (1440 x 2560 pixels) capacitive touchscreen display, which is supposed to appeal to more customers if Motorola decides to launch the device worldwide. Apart from the smaller screen, DROID Turbo offers the same specs as the Nexus 6. So, expect the same powerful 2.7GHz quad-core Qualcomm Snapdragon 805 processor, Adreno 420 graphics processing unit and 3GB of RAM. The DROID Turbo comes with either 32GB or 64GB of internal memory, but just like the Nexus 6, it lacks microSD card slot for memory expansion. On the back, the smartphone boasts an enhanced 21-megapixel photo snapper with autofocus, dual-LED flash and 4K video recording. There’s also a 2-megapixel camera in the front for selfies and video calls. It’s also worth mentioning that DROID Turbo ships with Android 4.4.4 KitKat operating system out of the box, but it has been confirmed for a Lollipop update by the end of the year.